William Lloyd Garrison, whose name is indissolubly connected with the abolition of American slavery, was born in the seaport town of Newburyport, Mass., on December 10, 1805. His father, Abijah Garrison, was a sea-captain who came from New Brunswick to settle in Newburyport. Deserting his wife and children while the subject of this sketch was in infancy, his subsequent career is shrouded in mystery. Fanny Lloyd, the mother of William Lloyd Garrison, was a woman of remarkable character and personal attraction, with an intense religious nature. Dependent upon her own efforts for the support of the family, she cheerfully took up the calling of monthly nurse, and endeavored to rear her children with care and forethought, and with especial attention to their religious training. Upon her removal to Lynn, in 1812, Lloyd was left to the care of Deacon Ezekiel Bartlett and was sent to the Grammar School until, at the age of nine, he joined his mother in Lynn and was taught shoemaking in the shop of Gamaliel W. Oliver, a kind and excellent member of the Society of Friends, where his elder brother James was already an apprentice. In 1815, Mr. Paul Newhall, a shoe manufacturer of the same town, deciding to establish business in Baltimore, invited Mrs. Garrison and her two boys to accompany him. There Lloyd was employed as an errand-boy and James was again apprenticed at shoemaking. Mr. Newhall's venture proving unsuccessful, Mrs. Garrison was constrained to resume nursing and Lloyd was sent back to Newburyport, his brother betaking himself to the sea. From Newburyport he was sent to Haverhill to learn cabinet-making; but, in spite of kind treatment, he disliked the occupation and ran away from his master, returning to Newburyport to live again with his mother's old friend, Deacon Bartlett. In 1818, Ephraim W. Allen, proprietor of the Newburyport Herald, accepted Lloyd, then thirteen years of age, as an apprentice and taught him the printer's trade. Here at once he found a vocation suited to his tastes and became a rapid and accurate compositor. The printing-office proved an excellent school for the young man, developing his literary taste and ambition. He was fond of reading, and delighted in poetry and fiction. Politics especially attracted him, and at the age of sixteen he wrote anonymous articles for the columns of the Herald. His first contribution was over the signature of "An Old Bachelor." He was an ardent Federalist and his political articles attracted attention by their forcible reasoning and direct style. Caleb Cushing, then editor of the Herald, discovering the lad's abilities, encouraged and befriended him. In 1826, Mr. Garrison, closing his apprenticeship with the Herald, became editor and publisher of the Free Press (Newburyport), within a few months of his majority. It was to this paper that Whittier made his first poetical contributions anonymously, and, upon the discovery of his true name, Mr. Garrison sought him out and encouraged him in his youthful efforts. After a brief existence of six months, the Free Press was sold and Mr. Garrison again became a journeyman printer, soon seeking employment in Boston, where, after various vicissitudes, he was employed by Rev. William Collier, a Baptist city missionary, upon The National Philanthropist, devoted to the "suppression of intemperance and kindred vices," becoming its editor in 1828. The paper had the distinction of being the first temperance journal ever printed, and among the earliest evidences of Mr. Garrison's interest in the slavery question was an editorial article by him commenting severely on the bill passed by the House of Assembly of South Carolina to forbid the teaching of reading and writing to the colored people. To Benjamin Lundy, a Quaker, and at that time editor of the Genius of Universal Emancipation, in Baltimore--a paper devoted to the gradual abolition of slavery--belongs the honor of first attempting to awaken public sentiment on the subject. Upon his visit to Boston, August 7, 1828, he made the acquaintance of Garrison, whose eyes he opened to the iniquity of the slave system. During the same year Mr. Garrison accepted the invitation of a committee of prominent citizens of Bennington, Vt., to edit the Journal of the Times, a weekly newspaper devoted to the re-election of John Quincy Adams against Andrew Jackson. While started for campaign purposes, the Journal of the Times declared for independence of party and advocated the suppression of intemperance, the gradual emancipation of the slave, the doctrines of peace, and the so-called American system of protection for fostering native industry. Attracted by the anti-slavery utterances of Mr. Garrison, Lundy resolved to invite him to share in the editorship of his paper, walking from Baltimore to Bennington for the purpose. His earnestness had the desired effect upon Mr. Garrison, who accepted his proffer and relinquished the Journal of the Times. Before going to Baltimore Mr. Garrison was invited to address the Congregational societies of Boston on July 4th, at the Park Street Church, and took for his theme "Dangers to the Nation." The poet John Pierpont was present and wrote a hymn for the occasion. The address was a stirring denunciation of slavery and a rebuke to the nation for its pretentious devotion to liberty. The speaker was accused by a Boston paper of slandering his country and blaspheming the Declaration of Independence. Upon his arrival at Baltimore, Garrison, having convinced himself of the necessity of immediate and unconditional emancipation, it was agreed, inasmuch as Lundy adhered to the methods of gradual emancipation, that each should sign his own editorials. Mr. Todd, a Newburyport merchant, having allowed his ship to be used in the inter-state slave trade between Baltimore and New Orleans, Mr. Garrison faithfully denounced in unmeasured terms his fellow-townsman, and asserted the equal wickedness of the domestic slave trade with that of the foreign traffic, which, at that time, was in the law considered piracy. Arrested, tried, and convicted of libel, although the facts were proven, Garrison was incarcerated in the Baltimore jail, April 17, 1830, in default of a fine of $50 with $50 costs. Undaunted in his captivity, he continued to write his protest against slavery and to record in verse his feelings. His famous sonnet, "The Immortal Mind," was written with pencil upon the walls of his cell. Liberated at the expiration of forty-nine days, through the generosity of Arthur Tappan, of New York, who paid his fine, Garrison visited Boston and Newburyport, endeavoring to speak in both places, but the doors of halls and churches were closed against him. At last the hall used by a society of avowed infidels, in Boston, to whom Abner Kneeland preached, was opened to Mr. Garrison for three anti-slavery lectures, and among the audience at his first lecture were Samuel J. 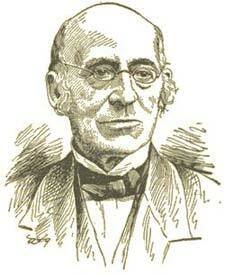 May, Samuel E. Sewall, and A. Bronson Alcott, who then gave in their adhesion to the cause. Dr. Lyman Beecher was also present but made no sign. Yet there the freedom of a race began." In the initial editorial appeared the famous declaration of Mr. Garrison, "I am in earnest--I will not equivocate--I will not excuse--I will not retreat a single inch--and I will be heard." Although its circulation was meagre, the publication of The Liberator made a tremendous sensation throughout the South, bringing upon its editor abusive and threatening language, and, at the North, unpopularity and persecution. The Legislature of Georgia offered a reward of $5,000 for his arrest and conviction. In 1832, the New England Anti-Slavery Society was organized in Boston, and the campaign for "immediate and unconditional emancipation" begun. The Colonization Society, which Mr. Garrison formerly supported but later denounced, became the object of special attack as an ally of the slave power, and, to counteract its designs, he sailed for England, May 2, 1833, to expose its proslavery purposes to the English abolitionists. He was cordially received by Wilberforce, Buxton, Zachary, Macaulay, Daniel O'Connell, and their associates in the struggle for West India emancipation, and before he left the kingdom he witnessed the passage of the Emancipation Act, and was present at the funeral of Wilberforce, in Westminster Abbey. Returning from his successful mission abroad he narrowly escaped the hands of a New York mob on landing upon his native soil. In December, 1833, the American Anti-Slavery Society was formed, in Philadelphia, and Mr. Garrison drew up its famous Declaration of Sentiments, which numbered among its signers many of the men and women destined to be distinguished in the anti-slavery cause, among whom was the poet Whittier. On September 4, 1834, Mr. Garrison was married to Miss Helen Eliza Benson, of Brooklyn, Conn.; a fortunate and happy union. In 1835, the eminent English orator, George Thompson, came by invitation to the United States to assist in the emancipation of the American, as he had of the West Indian, slave. The announcement that he would speak at a meeting of the Ladies' Anti-Slavery Society, held in Boston, October 21st, of the same year, was the occasion of a mob composed of wealthy and respectable citizens of Boston who aimed to suppress free speech and tar and feather Mr. Thompson. He was, however, prevented from attending by his friends, but the fury of the mob fell upon Mr. Garrison, who was seized and led through the streets with a rope around his body, from which position he was rescued through the efforts of Mayor Lyman and imprisoned for safety in the Leverett Street jail. This outrage created new friends and gave fresh impetus to the abolition movement. In 1840 Mr. Garrison again visited England as a delegate of the World's Anti-Slavery Convention in London, in which body, however, he declined to sit, because the women who were his fellow-delegates from America were excluded. Occupied continuously with the care of The Liberator and in lecturing, Mr. Garrison led an intensely active life, not confining himself alone to the anti-slavery reform but embracing among other reforms those of temperance, non-resistance, women's rights, and religious freedom. For, while educated by his mother in the strict tenets of the Baptist faith, he early experienced a change of theological views and cast off sectarian bonds. The Liberator was used for the expression of his individual beliefs and was not the organ of any society. In 1846, the Free Church of Scotland having sent emissaries to the United States to collect funds from the slaveholders, Mr. Garrison again went to England to urge the Church to return the money thus contributed, and, in company with George Thompson, Frederick Douglass, Henry C. Wright and others, agitated the question throughout Scotland. Convinced that the constitutional compact of the North with the South to guard and protect slavery was immoral and unjust, in 1843 Mr. Garrison raised the banner of No Union with Slave-Holders, and advocated the dissolution of the Union for the sake of freedom, a step which added fresh fuel to the flames of persecution and incurred the loss of many lukewarm adherents. In 1850, the apostasy of Daniel Webster and the passage of the Fugitive Slave Law increased the national ferment. The same year witnessed the famous Rynder's mob, in New York, and the anti-slavery meeting at the Tabernacle, at which Mr. Garrison spoke, was violently broken up. The abolition movement had now assumed formidable proportions, dominating the national parties and dictating issues. The Whig party fell to pieces in consequence, and to it succeeded the Republican party, with Sumner, Seward, Wilson, Giddings, and other earnest men as leaders. Meanwhile Harriet Beecher Stowe, by her famous novel, "Uncle Tom's Cabin," had given a vivid picture of the wrongs of American slavery to the world. The "irrepressible conflict" was now rapidly tending to its crisis, and, on the election of Abraham Lincoln to the Presidency by the Republican party, in 1860, the signal for civil war was given, and, in 1861, the struggle of arms inaugurated by the attack on Fort Sumter replaced the peaceful crusade of the abolitionists. The moral agitation of thirty years had produced its legitimate results, and when, in 1863, the President promulgated the emancipation proclamation the anti-slavery chapter was closed. The Union, which heretofore had been paramount to liberty, was now subordinated to it, and Mr. Garrison's antagonism necessarily ceased with the new amendment to the Constitution. He had been accustomed to denounce that instrument as a "covenant with death and an agreement with hell," but, as he expressed it, he had "never expected to see Death and Hell secede." Foreseeing the inevitable consequence of the war, he gave heartily his moral support to the Government in the struggle between it and the slave power. His non-resistance principles and abhorrence of war in no way diminished his interest in the great conflict, and his sympathies of necessity were with the soldiers of freedom. His eldest son, George Thompson Garrison, not sharing his father's scruples, enlisted in the Fifty-fifth Colored Regiment of Massachusetts Volunteers, attaining the rank of captain. The renomination of Lincoln for a second term, in 1864, developed a breach in the ranks of the old abolitionists, Mr. Garrison and his adherents supporting Lincoln, and others, under the lead of Wendell Phillips, advocating the choice of General Fremont. The latter candidate, however, withdrew from the field before the election. In April, 1865, Mr. Garrison, with his English friend George Thompson, was invited by the Government to be present as its guest at the ceremony of raising the Stars and Stripes above the surrendered Fort Sumter, and was received at Charleston with great enthusiasm by the emancipated slaves. The news of President Lincoln's assassination hastened the return of the party to the North. The practical extermination of the slave system by the adoption of the 13th Amendment convinced Mr. Garrison that the purpose of the Anti-Slavery Society and of The Liberator had been accomplished. He therefore withdrew from one and discontinued the other. After thirty-five years of a stormy and precarious existence the last number of The Liberator was issued December 29, 1865. "Nothing could have been more in keeping with the uniform wisdom of your anti-slavery leadership than the time you chose for resigning it," wrote Lowell to Mr. Garrison a year later. The recognition of the pioneer's unselfish service thereupon took shape in a national testimonial reaching a sum exceeding thirty thousand dollars, thenceforth lifting his life above the pecuniary cares which had so long weighed upon it. A domestic grief in the shape of a paralytic shock to his faithful wife occurred in December, 1863, compelling a change of home from the city to an attractive suburban house in Roxbury, known as Rockledge. Although his great life-work was finished, Mr. Garrison abated no activity in the various reforms in which he had enlisted. Both with voice and pen he reached a wider and more attentive public, pleading for justice to the freedman, for the legal emancipation of women, the right of the Chinese to free immigration and Christian treatment, freedom of trade (for he early eschewed his youthful belief in the protective system), and for kindred causes. Visiting England for the fourth time in 1867, a public breakfast was given in Mr. Garrison's honor at St. James's Hall, June 29th. John Bright presided, and among the addresses of welcome were those of Earl Russell, the Duke of Argyll, John Stuart Mill, George Thompson, and W. Vernon Harcourt. Later the freedom of the city of Edinburgh was conferred upon the American abolitionist, and in August he attended the International Anti-Slavery Conference at Paris, representing the American Freedman's Union Commission, and meeting Laboulaye, Cochin, and other eminent Frenchmen. And took both in the same unwavering mood." Unique among reformers, he received in life the reverence that usually reveals itself in post-mortem honors which indicate the late awakening of public consciousness and suggest the pathos of their delay. The felicities of domestic life were his in more than ordinary measure, and "honor, love, obedience, troops of friends," made his closing years as serene as his opening career had been stormy. Occasional ailments reminded him of advancing age, but his temperamental cheerfulness and faith in human progress never forsook him. The death of his dear wife, in 1876, was a visible blow to him, and in the next year, for physical and mental recuperation, he visited England again for the last time, with his son Francis, enjoying a delightful reunion with old friends and making new ones, as was his wont. In May, 1879, during a visit to his daughter in New York, he breathed his last on the 24th of the month, with all his children about him. He left four sons, named respectively, George Thompson, William Lloyd, Wendell Phillips, and Francis Jackson, and an only daughter, Helen Francis, the wife of Henry Villard. Two others, a daughter and a son, died at an early age. In 1885, Mr. Garrison's biography, written by his sons Wendell Phillips and Francis Jackson, was published by the Century Company, in four volumes, octavo. They contain not only the personal details of a famous career, but a careful history of the abolition struggle. To them the future historian must look for the most faithful picture of the anti-slavery times and their leader. A bronze statue of heroic size, executed by Olin L. Warner, of New York, representing Mr. Garrison in a sitting posture, was presented to the city of Boston by several eminent citizens, in 1886, and is placed on Commonwealth Avenue, opposite the Hotel Vendome. "The truth is, he who commences any reform which at last becomes one of transcendent importance and is crowned with victory, is always ill-judged and unfairly estimated. At the outset he is looked upon with contempt, and treated in the most opprobrious manner, as a wild fanatic or a dangerous disorganizer. In due time the cause grows and advances to its sure triumph; and in proportion as it nears the goal, the popular estimate of his character changes, till finally excessive panegyric is substituted for outrageous abuse. The praise, on the one hand, and the defamation on the other, are equally unmerited. In the clear light of reason, it will be seen that he simply stood up to discharge a duty which he owed to his God, to his fellow-men, to the land of his nativity."